Key players operating in the global legionella testing market include IDEXX Laboratories, Inc., Becton, Dickinson and Company, Thermo Fisher Scientific, Inc., Bio-Rad Laboratories, Inc., BioMérieux Inc., and Qiagen N.V., among others. 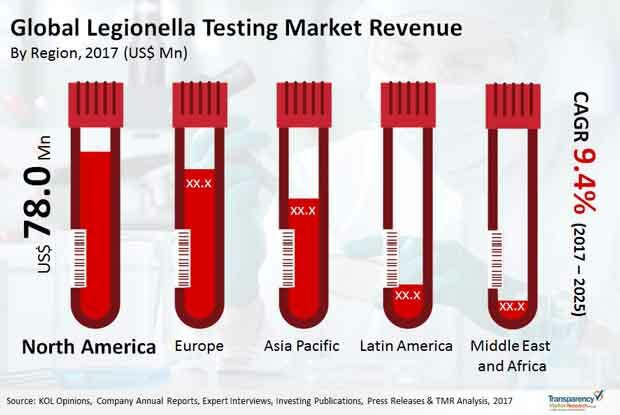 The legionella testing market is likely to retain a high degree of fragmentation in the coming years due to the lucrative prospects on offer in medical research facilities across a number of countries. According to Transparency Market Research, the global legionella testing market was valued at US$180 million in 2016 and is estimated to reach US$398.7 million by 2025 at a CAGR of 9.4% from 2017 to 2025. The increase in the number of legionella patients in North America and the presence of several of the legionella testing industry’s key players has led to steady dominance of the region in the global legionella testing market. For instance, in 2015, nearly 6000 people were diagnosed with Legionnaire's disease in the United States alone. Moreover, the supportive stance of European countries such as the UK, France, and Germany towards advanced healthcare research has allowed them to gain an important place in the global legionella testing market. In Asia Pacific and Latin America, increased awareness about healthcare has led to precautions being taken for early diagnosis of the disease and a rise in investments in the healthcare sector, which has led to rapid growth of the legionella testing market. Legionella bacteria are widespread in natural water bodies such as ponds and rivers. Inhalation of aerosol water particles containing legionella bacteria is a common way of contracting the pathogen. The rising awareness regarding the risk of contracting legionella-borne diseases from water bodies is a vital driver for the global legionella testing market. Technological advancements are boosting innovative microfluidic platforms which help provide satisfaction, safety, and stability to patients. Growing availability of up-to-date treatment facilities and rise in the number of skilled doctors, consultants, and healthcare services are helping drive the legionella testing market. The incidence rate of several infectious diseases is increasing globally, particularly in developing regions. Indications such as waterborne, airborne, respiratory, and sexually transmitted diseases are increasing at an alarming rate in countries across the globe. Highly populous regions such as APAC, MEA, and Latin America have a high incidence of infectious diseases, which is leading to a steady increase in the demand for diagnostic kits. Thus, the global legionella testing market is expected to witness substantial growth over the forecast period. Currently, the incidence rate of infectious diseases is minimal in developed countries due to the availability of better healthcare and lifestyle standards. However, transmission of diseases across regions through migration is increasing, which in turn is expected to fuel demand for diagnostic tests and kits in these regions. Additionally, increasing healthcare spending is expected to result in increasing demand for better and faster legionella testing and diagnostic methods, and in turn create high growth opportunities for players in the global legionella testing market over the forecast period. However, rise in the cost of treatment, lack of reimbursement policies for legionella testing in developing regions, and side effects associated with legionella treatment are restraining the growth of the market.